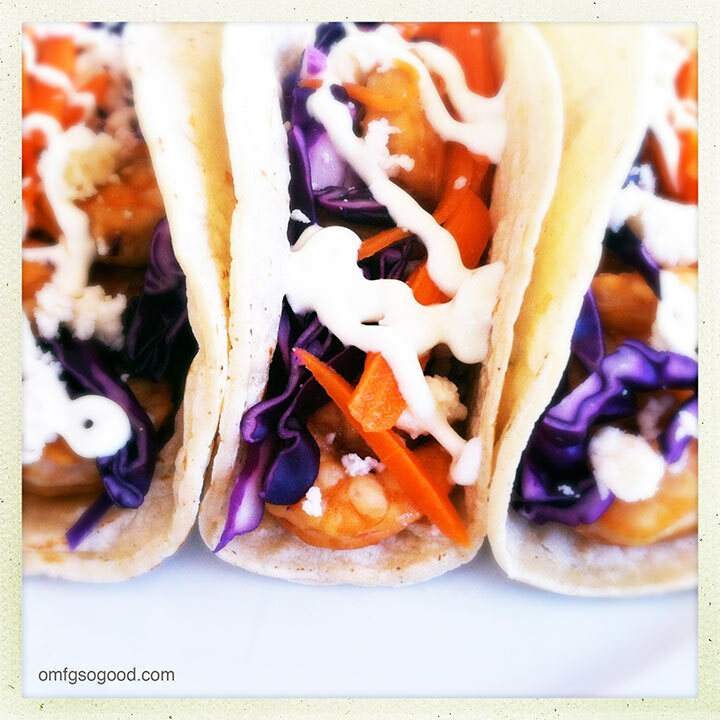 sesame ginger shrimp tacos with wasabi crema | omfg. so good. I’ve been on a major taco kick lately. All kinds of tacos, all up in this hizzy… Chicken Tacos with Chipotle Crema, Carne Asada Tacos, and these Sesame Ginger Shrimp Tacos with Wasabi Crema. I have to say, of the three most recent creations, these are my favorite. Hands down. I’m a huge fan of the flavor of toasted sesame oil combined with fresh ginger. Additional brightness and crunch from homemade pickled carrots and shredded purple cabbage, and the cool heat of wasabi crema? To make the shrimp, combine the lime juice, sesame oil, sesame seeds, ginger, soy sauce and scallions in a small bowl and whisk to combine. Put the cleaned, raw shrimp in a large ziplock bag and pour in the marinade. Seal and refrigerate for 3 – 4 hours. To make the pickled carrots, combine the water, rice wine vinegar, sugar and salt in a small saucepan and bring to a boil. Remove from heat and let cool to room temperature. 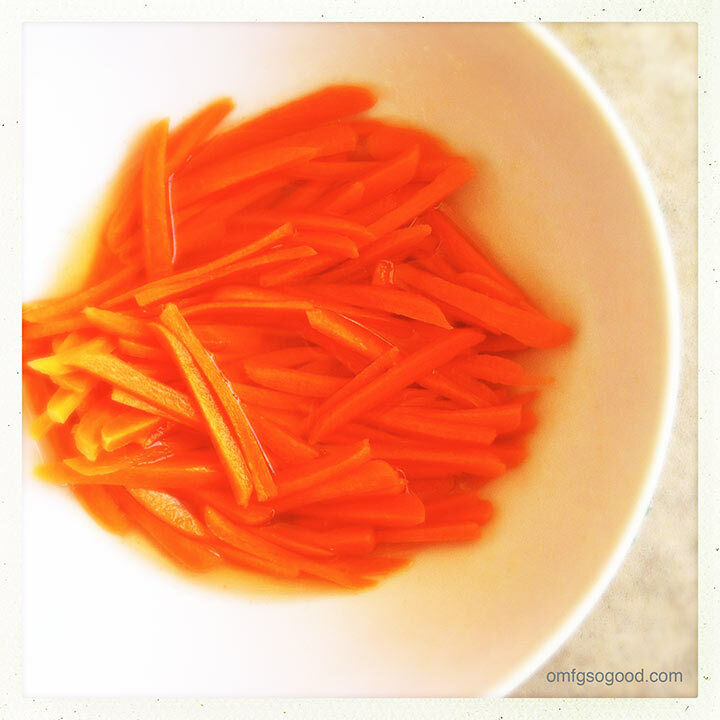 Put the julienned carrots in a heat proof bowl, and pour the pickling brine over the top, cover and refrigerate. To make the wasabi crema, combine the sour cream, wasabi paste, lime juice and a small dash of salt in a small bowl and whisk to combine. Cover and refrigerate until ready to use. To cook the shrimp, drain the marinade into a bowl and set aside. Heat a drizzle of vegetable oil in a large saute pan then add the shrimp and cook until they turn slightly pink and start to curl up, just a bit. Transfer to a ceramic or glass bowl and set aside. Pour the reserved marinade into the hot pan. Bring to a boil and cook to reduce to around half the original amount (15 minutes or so.) Pour the reduced sauce over the shrimp and toss to coat. To assemble the tacos, heat the corn tortillas in a super hot skillet for around 30 seconds on each side. Arrange 3 – 4 shrimp on each tortilla, top with pickled carrot sticks, shredded cabbage, queso fresco, and a drizzle of wasabi crema. 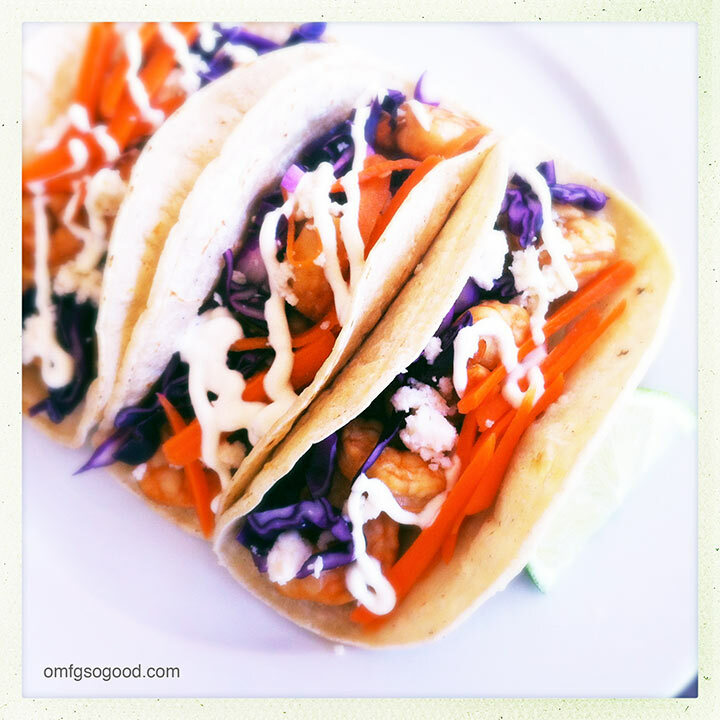 These aren’t your average, every day shrimp tacos folks. Bring your A-game and be fully prepared to eat more than one. Yum! That looks amazing. 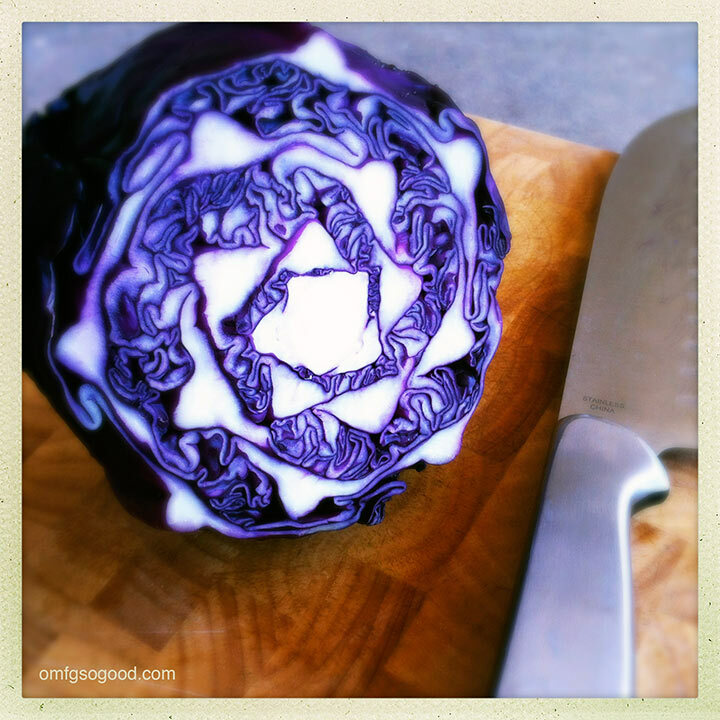 I love the shot of the red cabbage–I’m amazed every time I slice one in half! The wasabi crema sounds to die for, too. Thanks for sharing!